Who's the real Abu Jindal? Intelligence reports have claimed that Zabiuddin Ansari alias Abu Jindal was the Indian link in the country's worst-ever terror attack -- the 26/11 carnage. They have pinpointed Ansari as one of the men who guided and instructed the terrorists while they went on a rampage slaughtering innocent victims in Mumbai. Rediff.com's Prasanna D Zore travelled to Beed to track the beginning of the terror trail, to find out how Ansari, a quiet wireman, tranformed into Abu Jindal, one of the most wanted terrorists in India right now. Read Part 3: Where are the missing students of Beed? Who's the real Abu Jindal aka Zabiuddin Ansari? 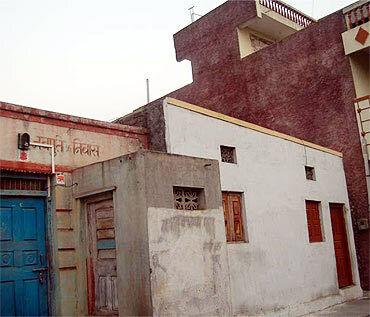 This is one of the most disturbing questions that the residents of Beed and Gevrai towns, in the dusty cotton bowl of Beed district in Maharashtra, are trying to come to terms with ever since news broke out that intelligence agencies have identified one of the handlers from Pakistan, who spoke to the 26/11 terrorists at the Chabad House, as Syed Zabiuddin Syed Zakiuddin aka Abu Jindal. Zabiuddin reportedly hails from Beed, and has been missing since 2005. Ajmal Kasab, the lone terrorist arrested during the terror siege in Mumbai, had last July stunned the special court trying him at Mumbai's Arthur Road jail, when he revealed that a person named Abu Jindal had tutored all the 10 terrorists on how to speak Hindi. The intelligence agencies have surmised, for want of voice samples of Syed Zakiuddin, that Abu Jindal could be Syed Zabiuddin. The transfer certificate as well as a copy of Zabiuddin's hall ticket documents available at the Milliya Arts, Science & Management Science College and Bal Bhim College in Beed clearly proves that the name of India's most wanted fugitive is Syed Zabiuddin Syed Zakiuddin (unless Syed Zabiuddin and Syed Zabiuddin Ansari are two different people) as against Syed Zabiuddin Ansari, as has been widely reported in the media. 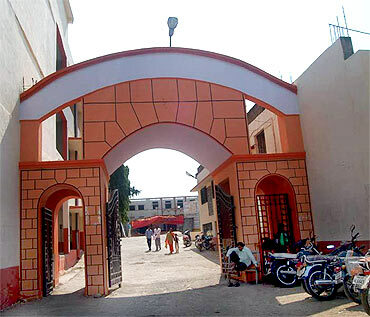 Rediff.com accessed the registration record of Zabiuddin at Bal Bhim College, where he studied till Class XII (transfer certificate number 332) and his BSc final year (2004) hall ticket. The hall ticket, numbered ACO34137 and issued by the Babasaheb Ambedkar Marathwada University, bears his name as Syed Zabiuddin Syed Zakiuddin. The transfer certificate is a document that students have to submit to an educational institution when they pass out of Class XII and seek admission for graduation courses. The faculty of both the colleges, and some of the neighbours of Zabiuddin's family, confirmed to rediff.com that his name was indeed Syed Zabiuddin. It's not possible that the person wanted in the Aurangabad arms case and 26/11 Mumbai terror attacks can be both Syed as well as Ansari," claims one of his neighbours in Beed. His confidence stems from the fact that the Syeds are considered an upper caste, whereas Ansaris are considered several notches below in the caste hierarchy so typically prevalent among Muslims in the Indian subcontinent. He said that Ansari could be a tag appended by the Lashkar-e-Tayiba to his name to confuse India's intelligence agencies. Some of the locals, who have interacted with Zabiuddin in Beed, cannot believe that he could ever become the mastermind of a terror attack. Zabiuddin worked as an electrician in Beed sometime in 2004-05, before he went missing, according to these people. He even worked at the newly refurbished superintendent of police's office in Beed as a wireman. "Why couldn't the police as well as crime branch officials (the local crime branch office is located in the SP's office) identify a terror mastermind in their midst," asks one of Zabiuddin's neighbours in Beed. 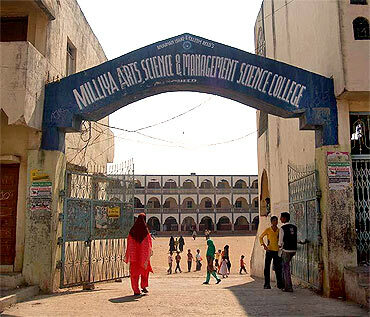 Faculty members, who taught Physics, Chemistry and Mathematics between 2001 and 2004, when Zabiuddin was a student of the Milliya Arts, Science & Management Science College, said he was an average student who never attracted anybody's attention. "We remember mostly those students who are either notorious or rank in the college's merit list for a long, long time. Zabiuddin didn't fit into any of these categories," said one college professor. Was he a member of SIMI? That's what is corroborated by one of the few people who knew Zabiuddin in his college days. "He was an average student. He didn't ever show sparks of brilliance that could have made us believe that he could become a terror mastermind one day," he said. One of Zabiuddin's professors recalled that he was an irregular student in college and sometimes skipped classes for two to three days. Assuming that he bunked college to work for the Students Islamic Movement of India, this is the only indication, however remote, that Zabiuddin could have been a SIMI activist in his college days, . "His absence from college for so many days together does seem to indicate that he was under the influence of SIMI, who had penetrated rural areas in Maharashtra post the Gujarat communal carnage in 2002," said a member of the BJP's minority cell in Beed's Gevrai village. However, professors at the Milliya and Bal Bhim College (both located a stone's throw from each other in Beed) don't agree with this view. "We never saw anything unusual in his absence from the college. He never looked like he was fanning the SIMI agenda in our college," said a Milliya College teacher. Says one of Zabiuddin's neighbours in Gevrai, "If the intelligence agencies are claiming to have figured out that Syed Zabiuddin is Abu Jindal who trained the 26/11 terrorists, then it must be true. They couldn't have done that without ascertaining the facts first." "The conundrum, whether Zabiuddin is Abu Jindal, can be solved easily," offers one of the Hathi Khana residents. His theory is that the intelligence agencies can solve this puzzle without Zabiuddin's voice samples. "Why do you need voice samples when you have one of the terrorists in our custody? Just show Syed Zabiuddin's photograph to Ajmal Kasab and let him identify if he is the same Abu Jindal who taught him Hindi. I'm sure Kasab must have seen Abu Jindal during their Hindi learning sessions at the LeT camp. Can't the intelligence agencies perform such a simple task and clear the air in this matter," he looks askance.